In our working lives and beyond we are increasingly faced with ill-structured complexities that defy conventional problem solving methods. Underlying assumptions, scope, purposes, patterns, mechanisms, and their relevance or significance must be critically examined and so should the selection of people who can best contribute to this critique. A well-founded methodology for doing so is the dialectical systems approach of Churchman, an American philosopher and management scientist who lived from 1913 to 2004. 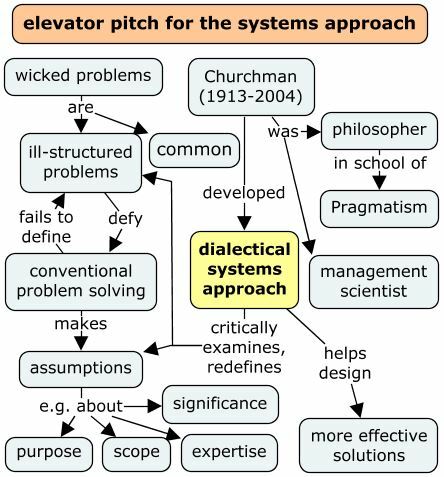 A powerful step-by-step method for learning Churchman’s approach is described in “Wicked Solutions: a systems approach to complex problems.” This method provides (1) a common framework and vocabulary to (2) structure complex organizational and business problems and develop (3) innovative, effective ways to address them. It is (4) a highly generic approach suited to a broad range of team learning conditions. It also introduces learners to (5) critical and systems thinking, generally. The approach is well suited for (6) integration in secondary and tertiary curriculum. No student should leave college or university without critical working knowledge of the general characteristics of ill-structured, wicked problems and one or more generic methods to address them. (First approximation, 180 words).